Who knew that the beautiful Chapel at the House of St Barnabas was tucked behind Foyles loading bay just off the Charing Cross Road in London’s West End? I was lucky enough to visit St Barnabas on Tuesday to see what The Failure Files on Tour had to say about the F word. The Failure Files is a collection of different approaches to failure inspired by a RSA journal article back in 2008 which is encouraging us all to embrace the Glory of Failure. Good thing too. I’ll tell you why. We already know that innovation and failure are best mates. If individuals, organisations and society are going to develop, create and innovate we must confront and redefine our attitude to failure. We have to stop thinking of failure as a bad thing. We need to stop being afraid of failure and realise that to fail means we have tried and learnt. Failure is progress. David Hillson had an interesting perspective, he said that if you are not failing you are not trying hard enough. You are just sticking to your comfort zone, never venturing to try something new. David talked about the complex interdependent relationship of success and failure, and how one cannot exist without the other. That’s when you get innovation and breakthroughs. David calls this the Success/Failure ecocycle. So in order to achieve success we need to, basically, get over ourselves, become resilient to failure and learn to embrace it. To do this we must stop pushing failure under the carpet, but announce it, learn and help others learn from it. We must reframe failure as healthy. True failure does exist. True failure is not trying at all, or giving up too soon or not being open to learning or changing. 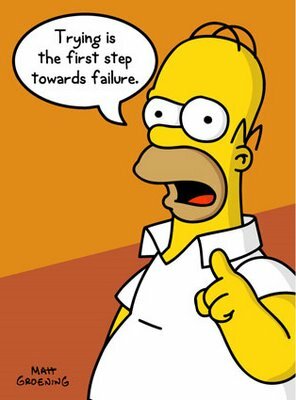 If you are serious about innovation you have to embrace failure and that means doing it, not just saying it. So how do you live the Failure dream? Lead by example and admit to your failures. I dare you to try it. Come on tell me some fails here. Celebrate the failure; a team I trained in innovation had a ‘fail yea!’ session on their team meeting. They loved it. Focus on the learning; what will you do differently next time? The fail yea! team meeting discussion lead to some hugely successful fundraising events, that simply would not have happened if failure had been hidden away. Share it widely; come on, it will help others not to make the same mistake. You will be respected for it. This entry was posted in creativity, Evolution, failure, fundraising, Innovation, Inspiration, passion, procrastination, SOFII - Showcase of Fundraising Innovation and Inspiration and tagged comfort zone, David Hillson, fail yea!, failure, failure files, failure files on tour, fundraising, glory of failure, homer simpson, Innovation, St Barnabas, success, walk the walk. Bookmark the permalink.